I would like to introduce you to newbie, self-pubbed author, Ariana Zamora. Her journey into self-publication can be related to by many, as can her excitement to release her debt book, THE DREAMER, to the world. Amy: Hi Ariana, thanks for joining us today. I’ve heard some great things about your new book. Why don’t you share a little about it? Ariana: I always get so embarrassed when people ask me this question. Writing has been a very personal hobby of mine for so long that when I hear someone ask, “Hey, what’s your book about?” my mind translates it to “Hey, what color underwear are you wearing?” Strange, I know, but I can’t help it. 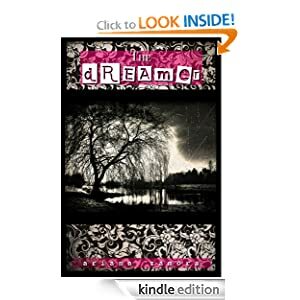 THE DREAMER is about a young girl named Anjaleena Jamison who can’t seem to find her place in the world. We’ve all been there at that awkward stage in life when you feel like no one understands you; that you’re the only person who gets what you’re going through. I know I’ve been there. It’s crazy to think about it now because I’m older and realize that the world is much bigger than the little bubble I’d thought it was before. Before I go any further, I should mention that Leena has been tormented by a nightmare her entire life. As soon as she wakes up she forgets every detail about it besides the creepy voice of a woman calling her name. Anyway, Leena’s little bubble of a world bursts when her Grandma Rose passes away unexpectedly. At her funeral a woman Leena has never met gives her a letter that Grandma Rose had written to her before she died. No, I’m not going to tell you what it says! Sheesh. When Leena and her father go to clear out her grandmother’s possessions from her house, Leena comes across Grandma Rose’s journal and finds out that she had also been suffering from nightmares her entire life, and it’s somehow connected with an old house that Rose had lived in when she was a young girl. Do you see where I’m going with this? The family moves, Leena and her younger brother are crushed, and then spooky stuff starts to happen. On Leena’s first day at her new home in Myrtle Creek, Oregon, she’s confronted by the ghost of a man who died over one hundred and fifty years ago – Julian Bennett. He doesn’t know how he’s died and he can’t ‘cross-over’ until he figures out the mystery behind his death. Soon, Leena discovers that there is much more to Julian than what meets the eye, and he’s got one heck of a past…she should know; she’s been in it. Somehow Leena is able to travel back to the past to witness parts of Julian’s life. But what happens when she sees too much? Or worse – what happens when she develops feelings for a man she knows she can never be with? There’s no way it would work…for one, he’s dead. Secondly, his past is so shrouded in murder and mystery that she cannot determine whether or not he can be trusted. The end! Amy: I’m excited to give THE DREAMER a read through. I love that you have priced it at $0.99. That’s my favorite price range! So what do you think makes your book stand out among all of the other teen novels right now? Ariana: I’d like to think that The Dreamer brings something new to the table. I wanted Leena to have more grit and spirit than what I’m used to seeing in other characters. She’s not a shy, bumbling, idiot that wants to remain anonymous. She’s a go-getter who is thrown into an impossible situation and has to figure out how to deal with it, while at the same time, she has to find a way to maintain her hold on her childish innocence. Of course she’s not perfect and will make mistakes, but it keeps her life interesting, which, in turn, keeps the book interesting. Amy: I totally agree. I love strong characters, especially when they are a leading woman. And, it looks like your readers would agree. You’ve received some nice reviews for THE DREAMER in the past week. Sounds like people are waiting for a sequel. Any plans for a future book? Ariana: I am very pleased to say YES, there will be a sequel to The Dreamer coming out later this year. Keep an eye on my website for release date announcements. Amy: I’m excited to hear that you are already working on another book. You sound just like me: always busy! So how has your journey as a writer progressed? Can you share your experience of trying to break into the self-published world? Ariana: I’ve always wanted to write – I’ve known that since fourth grade. Distinguishing the difference between wanting to write and actually writing something worth sharing, now that was the tricky part. When I finished a story in the past, I’d print it out and put it in a folder, and then put that folder into a box, and that box would go on top of a shelf in the closet to be abandoned and forgotten in the Land of I’m-Kidding-Myself. It wasn’t until much later that I discovered this site called Wattpad where other writers were sharing their work and getting feedback. It was a quick, efficient, and anonymous way of seeing what people thought of my work. Sure, you have to shuffle through a lot of scruff to get to some good stories, but it’s worth it. It’s like an outlet store…you have to dig through piles of clothes before you find something that makes you want to lie to your friends about how much you really spent on it. Hey, don’t tell me you’ve never thought about doing that! The site strengthened my confidence in my work and I received a lot of great feedback and constructive criticism from other writers, of which I am extremely grateful. To this day – and I have no idea how it happened – my sister found me on Wattpad and read the story I was working on. She had a fit when she discovered that I was writing and that I hadn’t told her. She’s the one who actually pressured me into considering publishing The Dreamer. I had toyed with the idea in my head but put the likeliness of someone wanting to read my work somewhere down by the likeliness of someone wanting to willingly give up a vital organ. Then she introduced me to one of her ‘reader buddies’ who poured herself into my story and came out saying, “Ari…this is good,” all serious-like. My sister gave me the stink eye, clearly stating, “I told you so.” A few more words of praises and pats on the back and my ego and confidence were nice and bloated. I decided to publish. But how? I will be the first person to admit that I, Ariana Zamora, am the biggest baby. When I asked guys to be my boyfriend back in school, I’d pass a note to a friend who gave it to their friend who passed it to the guy to pass back through the line of friends to pass back to me….if THAT makes any sense. Basically – I can’t stand rejection. So query letters were out. I’m the kind of girl who just likes to rip the bandaids off nice and quick. I read about this cool thing called self-publishing that costs literally no money and it’s a way to get my story out there. I’d have to do the marketing myself, but, hey, it’s not like I had anything else planned to do. So now I am a self-published author. People may call me a ‘vanity’ author because I didn’t publish the traditional route…but, me? Well, I say congratulations to those authors who are so much braver than me. Someday it might happen, but for now I’m having a ton of fun doing things my way. Amy Miles: Self-publication is a fantastic way to go if you want to gain a readership, over time, and make a little money. Well done for starting your journey. I look forward to seeing you in a top 100 list someday! Do you have any advice that you would like to share with future writers who haven’t taken that step of faith into self-publication? Ariana: Honestly, I would just say be true to yourself. If you think you’ve got a great story then go for it, but remember to have fun. If you’re doing it for the money then you’re doing it for the wrong reasons. You’re not going to become a multi-zillionaire overnight, and if that’s what you’re expecting then this isn’t the line of work you should be in. Another thing I’d say, especially if you’re going the self-pubbed way, is to EDIT YOUR WORK. Not once, not twice, but multiple times. Read, read, read, and re-read your work and pass it on to other people to read as well. Get their opinions about the story and really open your mind to their input. Something may not have clicked with them in the story and you may need to go and clarify some things. I had to. I had the story down pat in my head, but none of my readers did, so some aspects threw them for a loop. I’m thankful that my pre-readers caught some of these things so I could fix it before releasing the story out into the big, bad, world. The last thing I’d say, which is something I’m still struggling with, is stop comparing. You’ll publish your book and you’ll go and read a book by a different author and you’ll start to panic because their book is ‘so much better than yours’. Stop this. Stop this right now. You’re not going to accomplish anything besides making yourself sick. You should be proud of the work that you did, so take a deep breath and relax. You are a superstar. Amy: Thank you for sharing. I know many of us need to hear those reminders on a daily basis! So what is one unique thing your readers should know about you? Ariana: You mean besides the fact that I’m deathly afraid of potato roots and clowns? Right…. Well, I am always willing to chat with my readers and answer any questions that they have. I am open minded and would love input on what you’d like to see happen in the story. Are we talking random facts here? Hmm…I have an abnormal addiction to killing zombies on Xbox live. I also cannot leave the house without a fun size bag of salt and vinegar chips in my purse. Oh, and sweet tea is the best drink in the world, I don’t care what anybody says. Amy: I’m a Dr. Pepper fan myself, but I can see the sweet tea thing. Ha Ha. So where can we buy your book or connect with you? Ariana: As of right now (June 26th, 2012), The Dreamer is available on Amazon and on Smashwords. I’m still waiting for the final approval from Barnes and Noble, but it should be available there within the week. Hopefully, at least! My mom has a Nook and she’s been throwing a fit because everyone else has read it besides her, haha! The Dreamer is currently only available in e-Book formatting. Amy: Thank you so much for sharing your debut novel, THE DREAMER, with us. I look forward to downloading my own copy!